As a Christian, you must have been hearing the word Miracles in various church programs, crusade, church services, Television Broadcast, Radio etc, but what exactly is the meaning of the word Miracle? A Miracle is something that according to the laws of nature isn't supposed to happen but happen. All of us have needed a miracle in the past, need one now, or will need of one in the future. The problem is that most Christians don't know how to receive a miracle from God. One of the purposes of this book is to show you how to receive a Miracle from God? Most Christians believe that God does miracles, but simply believing God is able to do it is not enough. You must know how to receive it. You will also know whether a Miracle is from God or Satan.You must also be hearing of Breakthrough in your marriage, Business, Your life etc. The breakthrough means an instance of achieving success in a particular sphere or activity. You will also know how to breakthrough in any department of your life. When do you achieve a breakthrough? How do you create a breakthrough? What can stop you from achieving a breakthrough? Find out from this book. 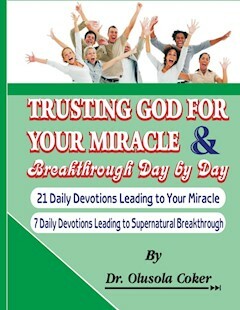 The wonderful daily devotional in this book is designed to ensure that you achieve a miracle and breakthrough in any department of your life. As a Christian, you must have been hearing the word Miracles in various church programs, crusade, church services, Television Broadcast, Radio etc, but what exactly is the meaning of the word Miracle? A Miracle is something that according to the laws of nature isn’t supposed to happen but happen. All of us have needed a miracle in the past, need one now, or will need of one in the future. The problem is that most Christians don’t know how to receive a miracle from God. One of the purposes of this book is to show you how to receive a Miracle from God? Most Christians believe that God does miracles, but simply believing God is able to do it is not enough. You must know how to receive it. You will also know whether a Miracle is from God or Satan. You must also be hearing of Breakthrough in your marriage, Business, Your life etc. The breakthrough means an instance of achieving success in a particular sphere or activity. You will also know how to breakthrough in any department of your life. When do you achieve a breakthrough? How do you create a breakthrough? What can stop you from achieving a breakthrough? Find out from this book. The wonderful daily devotional in this book is designed to ensure that you achieve a miracle and breakthrough in any department of your life. The best advice doesn't wait until a storm hits to learn how to believe God for a miracle. During a storm, emotions will cancel out your faith. We need to clarify the difference between a blessing and a miracle. A miracle is a supernatural intervention of God in a crisis situation. A blessing is still God’s power, but it flows through natural channels. Blessings are better than miracles. If you live your life from one miracle to the next, you will live from crisis to crisis. It’s better to be blessed with good health than to always need divine healing. God’s will is for us to walk in blessing. However, we all need a miracle at some time to simply jump-start our faith. If it weren’t for miracles, we wouldn’t grow to the point where we could walk in the blessings of God. Many Christians just wish and hope it happens. They think there is no way to grab a hold of miracles and make them happen. That’s not what the Bible teaches. You must believe that miracle is from God. You must learn the laws of God and how they work, and miracles will happen. Make sure to deal with any hindrances that could block God’s healing power or other blessings such as unbelief, unforgiveness, etc. Beware of sins and make sure you don’t sin at all and when you do ask for forgiveness immediately. Be aware of Satan’s strategies to rob you of your health or other blessings. Slow down. Give yourself time and space. Never be in more of a hurry than you have to be. Allow time for thinking, musing, just noodling around in your head with no apparent purpose. Give space in your thinking for ideas you haven’t had yet; allow openings for sniffing out the ideas of others. Haste is the enemy of creativity. Being busy all the time is a great way to stop any possibility of breakthroughs. You won’t break out of your old habits by rushing. When people are under pressure, they don’t have the energy to try anything new. Go on Holiday to get a refresh. Deliberately step outside your comfort zone. See what you can find. You may come back a changed person. Look for Ideas to change your thinking which will increase your productivity. Dear Lord, I thank you for the opportunity to come before your throne of grace. Thank You for your steadfast love that has never ceased in my life, in Jesus’ name. Father, if there be any sin in my life that is hindering my miracle from coming forth, please forgive me, in Jesus’ name. Father, you said if I ask, I will receive; If I seek, I will find; and if I knock on the door, it will be opened to me. I am asking, seeking and knocking on your door for a miracle in my business. Father, bow down your loving ears and hear the cry of my petition for a miracle in my business in Jesus Name. Heavenly Father, you are the God that performs miracles; display your power in my life by giving me a miracle that will boost my business in Jesus name. Father, make known to me the path of a miracle filled life; fill me with joy in your presence and with eternal pleasures at your right hand, in Jesus’ name. Father, reward me with an uncommon miracle in my business according to my righteousness, according to the cleanness of my hands in your sight, in Jesus’ name. Lord, assign me my miraculous portion in the land of the living, in Jesus’ name. I use the blood of Jesus to cancel all ungodly delays to my miracle in my business in Jesus’ name. Father in heaven, hasten your word and let there be a performance of your promises in my life, in Jesus’ name. Angels of the most high God, roll away every stone blocking the manifestation of my miracle in my business in Jesus’ name. Holy Spirit of God, help me to be at the right place at the right time when the moment of my miracle comes, in Jesus’ name. Father, bless me with a miracle in my business that will draw others to You, in Jesus’ name. Father, wrought special miracles through my hands for others, in Jesus’ name. Thank You, Father that my miracle is on the way, in Jesus’ name. Lord I thank you for it is your will that I live a fulfilled life in Jesus name. My father and my God, any sin in my life standing to hinder me from being fulfilled in life and in my marriage, show mercy and forgive me in Jesus name. Powers attacking my fulfillment in life and my marriage be destroyed in Jesus name. I shall not die, but live to declare the works of the Lord in Jesus name. Lord cause me to be old and well stricken in age and bless me in all things including my marriage in Jesus name. I decree and declare that I shall prosper, be in health even as my soul prospers in Jesus name. I decree and declare, no thief shall come to steal, kill or destroy me, my family, business, my marriage and my destiny in Jesus name. I decree and declare; I shall not cast my young or be barren in Jesus name. I decree and declare; no one related to me shall cast their young or be barren in Jesus name. I decree and declare, I shall fulfill my days and destiny in Jesus name.